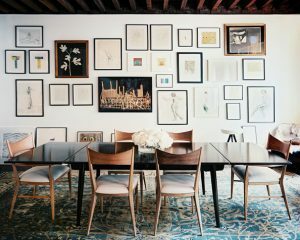 I like the look of gallery walls, and often use them in my own spaces. The image above is from a small apartment I renovated and decorated. I find the key is making sure you have enough artwork to fill in the space, they don't look good if it's too skimpy. It's a great style, and can be an excellent way to use different frames and styles of art that you might have laying around. It can take some experimenting to get the layout perfect. I lay all the artwork out on the floor first, like a puzzle, and move things around until the overall fit looks right. From that point I choose the centre piece and hang that one first, hanging the others around that. In my opinion, it's not a perfect science. As you can see in these rooms it can be nice when colourful prints, photos and paintings are mixed together.